We offer 5* standard Premium Hotel Rooms, family villas, bungalows and an excellent range of facilities. Riverside is not your standard North Cyprus hotel, rather it offers it’s own unique character. 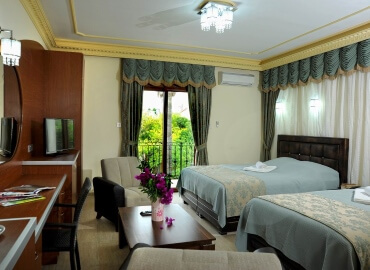 You can book your North Cyprus holidays at Riverside Garden Resort using the search bar above. You can fly from many airports in the UK, including Stansted, Gatwick, Heathrow, Birmingham and Manchester. We also offer North Cyprus holidays from many airports in Germany. 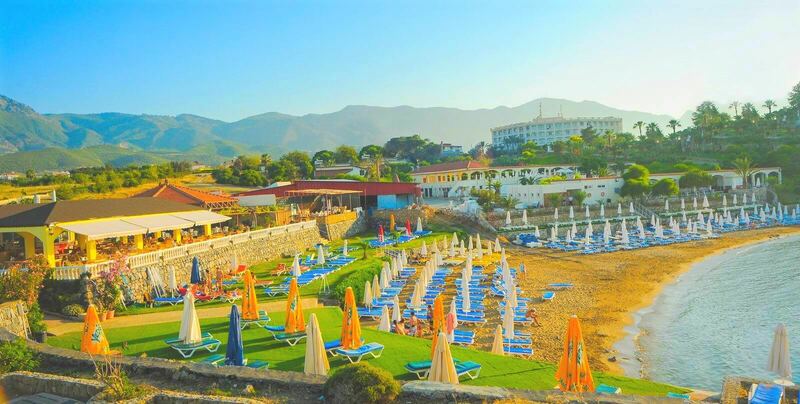 Choose to book either a North Cyprus package holiday, or hotel only booking. If you need any assistance with booking your holiday with us in North Cyprus, please contact us and we will be more than happy to help you. Riverside Garden Resort is set in the magnificent, tranquil foothills of the mountain range, an untouched and peaceful paradise, in a wonderful setting of some of the most spectacular gardens ever to be seen on the island. Our resort is famous for its natural and friendly atmosphere, and is run by a real Cypriot family. Riverside offers everything you need for fantastic North Cyprus holidays as a couple, as a family or as a single traveller. 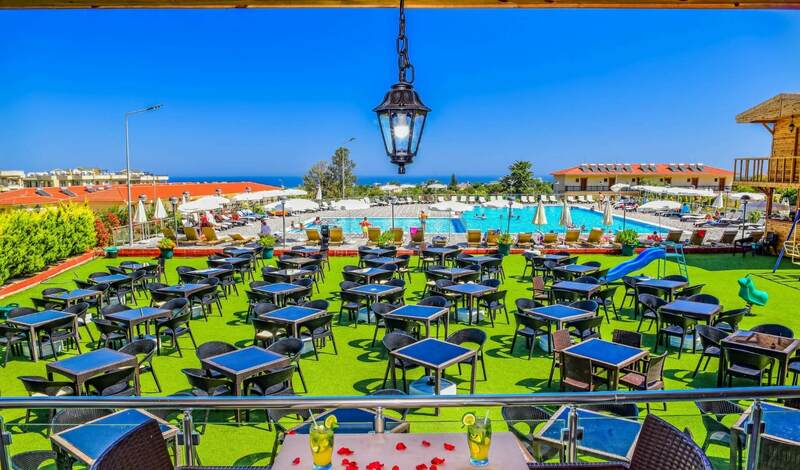 You will find everything you need here for a perfect Mediterranean holiday – great value for money, quality accommodation, good facilities and friendly staff at the Riverside Garden Resort. 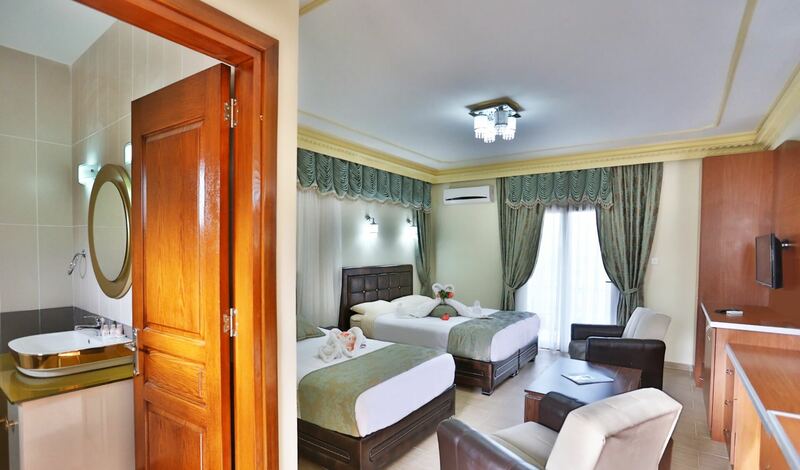 Riverside Garden Resort is proud to offer 212 brand new luxury high quality premium hotel rooms set amongst the beautiful gardens. Each hotel room contains a double and a single bed, satellite TV and internet access, as well as en-suite bathroom with Jacuzzi shower. Furthermore, there is a balcony so you can enjoy the views of the North Cyprus countryside. 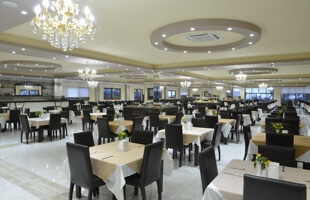 There is a brand new restaurant as well for guests to enjoy the fantastic cuisine. Spacious 1, 2 or 3 bedroom villas and bungalows are also available, and are ideal for families seeking to spend their holiday in economic accommodation. Riverside Garden Resort is a 4 star family-run holiday village with a multitude of facilities and services and offers one of the friendliest welcomes you will ever receive. Like most resorts all our hotel rooms, villas and bungalows are air-conditioned. There are two freshwater outdoor swimming pools and a fantastic aqua park with water slides, children’s playground and games room. We also offer a sauna, a massage parlor and baby sitting service. Outdoor facilities are also available including; horse riding, a tennis court and jeep safari tours. Here at the Riverside Garden Resort, we provide cheap package holidays including your accommodation, flights from major UK airports and return airport transfers. Just go to the orange bar above, enter your preferred travelling dates, then click on the search button to view our latest holiday deals. Alternatively, you can contact us and one of our reservation staff will be happy to help you with your booking. Cyprus is one of the last unspoilt, most beautiful and popular island destinations in the Mediterranean. The island has all the vital ingredients, sunshine in abundance, natural beauty and wonderful sandy beaches for the perfect relaxing holiday. There are plenty of activities for all age groups; couples, families with children and adults young and old. The island also offers various activities such as historical sightseeing, nature walks, bird watching, turtle watching and golf. Also available are scuba diving, paragliding, horse riding, mountain biking or jeep safari tours. The island of North Cyprus enjoys one of the healthiest and most pleasant climates in the world; winters are short and warm, and the North Cyprus weather is always predictable. The winter weather in North Cyprus is perfect for more strenuous activities or winter training for athletes. 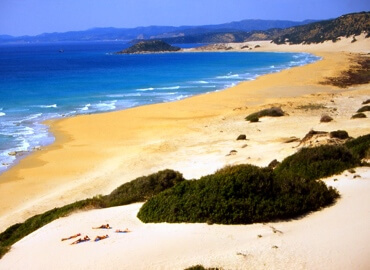 There are miles of coastline, with golden sandy beaches bathed in sunshine almost every day of the year; to swim in the crystal-clear waters of Mediterranean is a pleasure. The landscape varies enchantingly within short distances, from pine clad mountains to fertile plains. Mediterranean fruits are found in abundance, from olives to grapes and the finest vegetables, to every kind of citrus. Furthermore, mimosa, hibiscus, jacarandas and oleander are plentiful, amongst a wide range of other wildflowers. North Cyprus holidays are a kind to be experienced at least once in lifetime. Make this North Cyprus paradise your holiday destination this year at the Riverside Garden Resort in Kyrenia. All prices quoted are for Bed and Breakfast board basis, and Half Board is available at a supplement. Prices are based on a minimum of 2 adults sharing a room. Single supplement applies. Please contact us for more information or for special requirements / group bookings for a Northern Cyprus holiday. Riverside Garden Resort offers a free shuttle service to the sandy beach four times a day. A fantastic aquapark for children (and adults! ), including flumes, slides and a swimming pool for smaller children. 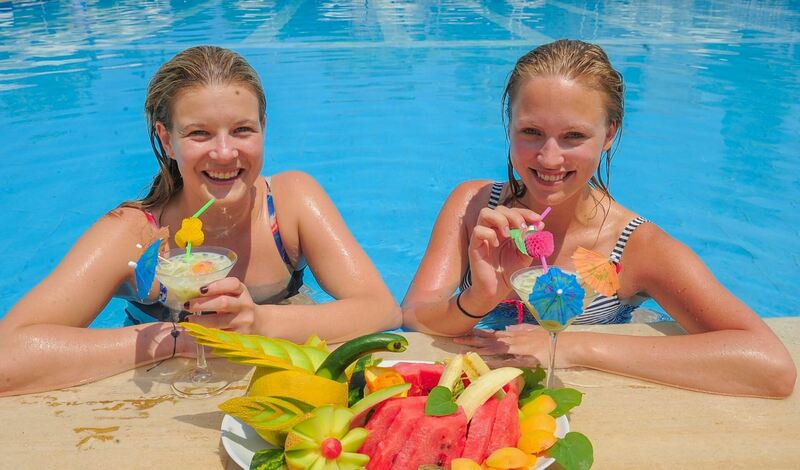 Just for adults, our adult-only pool is ideal for enjoying a relaxing drink and also sunbathing in peace and quiet. Our half-olympic swimming pool is great for exercising and plenty of sunbeds and umbrellas surround the pool. The new Premium Restaurant serves great Turkish and International cuisine open-buffet style, with luxurious decor. 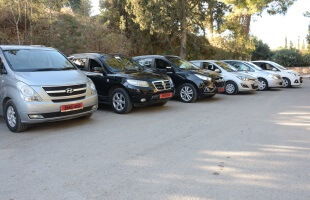 Riverside car rental service offers quality cars at affordable prices and are ideal for getting around and exploring North Cyprus. 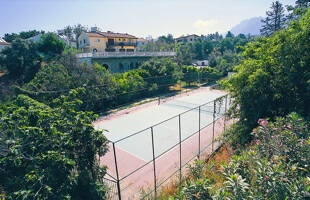 The full size, floodlit on-site tennis court is ideal for enjoying a game of tennis or two. 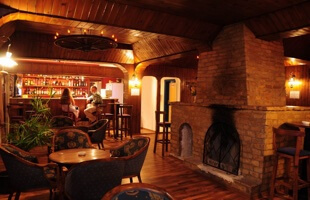 The Ranch Bar at Riverside Garden Resort offers a relaxing atmosphere to enjoy a cool drink after a day in the sun.